The game had featured several enhancements over Streets of Rage and Streets of Rage 2 such as a more complex plot, multiple endings, longer levels, more in-depth scenarios (with interactive levels and the return of traps like pits) and faster gameplay (with dash and dodge moves). Weapons could now only be used for a few times before breaking and could now be integrated with unique moves with certain characters, hidden characters were added and a few cutscenes were included to give the story greater depth. The game is more fast-paced than its prequels. Running and vertical-dodge moves were added, and most player attacks deal less damage than in the predecessors. The level timer has been replaced with a "power meter" that, when full, allows players to perform special moves without draining the player's life bar. 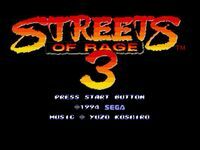 Unlike the first and second game, weapons in Street of Rage 3 can only be used a fixed number of times. However, additional weapon special attacks could be performed. The game also features team in which two characters work together to perform a powerful attack. Blitz moves, performed while players run, were altered so that they can be upgraded in strength over the course of the game. The player would have to earn a set amount of points on one life to upgrade it. Losing a chance would put the blitz move down a level, but the upgraded moves are still possible to do by pressing X on a 6 button controller, followed by a button sequence. Traps in stages were brought back from the original game, for example, enemies can once again be thrown into pits or off the side of an elevator. Enemy AI was expanded so more enemies can pick up weapons, block attacks, employ co-operative attacks (usually, a Big Ben-like enemy will throw one of the Garcia enemies at the character to smack them down), and even steal exposed food items to regain health. Source: Wikipedia, "Streets of Rage III", available under the CC-BY-SA License.